On the afternoon of September 4, 2014, we lost one of our most cherished Universal Life Church ministers, Joan Rivers. 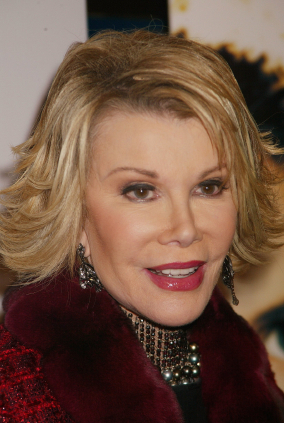 Joan passed away, at the age of 81, from complications encountered during vocal cord surgery. This loss is particularly painful for our church family because our Board Vice President Bruce Taylor, who began his publishing career in Las Vegas (where Joan frequently performed), was quite close with the fiery performer. 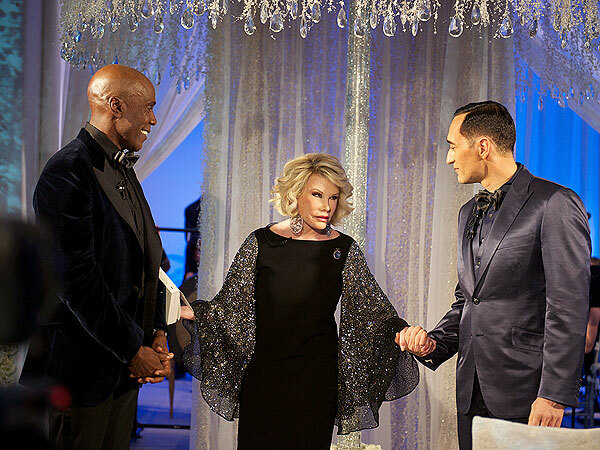 Joan became ordained online with the Universal Life Church on February 6, 2013 and used her ordination to perform weddings for several couples, many of whom were gay, over her year-and-a-half ministry. Indeed, Joan was a prolific advocate both for the religious freedoms protected and provided by an online ordination and for marriage equality. Reverend Joan took enormous joy in making the wedding days of couples as special as she could, and went out of her way to donate her services as a legal minister to lovebirds – sometimes officiating weddings on the spur-of-the-moment. At a book signing Joan held earlier this year, she married a couple who approached her table for an autograph. When that couple realized that some of their paperwork wasn’t filled out properly, Joan readily agreed to solemnize their wedding ceremony again to ensure that the union was properly formed. At the Universal Life Church, we occasionally hear complaints from ministers when we reference weddings performed by any one of our dozens of celebrity ministers. Many of these ministers fear that when celebrities get ordained online and solemnize weddings it makes a joke or mockery of their own ordination; we believe the opposite. Celebrity ministers like Joan who use their legal ordinations to solemnize lawful weddings, particularly when they do so from their highly visible platforms, they bolster the ordinations of all ULC ministers by asserting the validity of these ordinations in the public eye and demonstrating that any individual can and should have the freedom to lawfully officiate loving marriages. While we remember Joan most fondly as an active and charismatic ULC minister, most of the world knew Joan as a fiery comedian. Several of us grew up with Joan on our television screens, especially during her long tenure as Johnny Carson’s frequent substitute on The Tonight Show. Joan was one of the hardest working people in show business, and a beloved pioneer for female entertainers worldwide. Joan began her career in stand-u in the early 1960’s, and never really stopped performing – up to her death Joan was still doing regular dates across the country, starring in a self-titled reality show with her daughter Melissa, and acting as host of both an online chat show, “In Bed with Joan Rivers” and the wildly popular panel show “Fashion Police”. Joan, with her rapier wit and her brash diatribes, brought laughter to millions around the world. As a minister, Joan worked tirelessly to support love – regardless of the form it took – and inspired all of us to give more of ourselves to generate joy for the people around us. Rest in peace, Reverend Joan, you will be sorely missed. Reverend Joan you worked hard all your life. and you gave us so much. Rest in peace Joan you deserve it. (make god laugh now). Gilles Levesque, do you not realize the name “God” is a proper name and should always be capitalized? It’s common mistake, but a mistake that if you are going to be a minister, you should spell like one. When referencing God as a personal pronoun, “he” is to also be in a capital letter, “He.” The wonders of outcome based education. Snowden, I do not think our father takes issue with spelling. He is always pleased when we love on another. Shame never works. It is toxic. Sticks and stones may break your bones, but words can effect you for a life time. Did it ever occur to you, Snowden, that perhaps Gilles Levesque shares a different point of view on God/god, believing there to be (for example) a life presence of supreme creation, which does not have a proper name (and thus should not be capitalized). If you’re going to be a minister, you probably should consider choosing your words wisely until you know the entire situation. May the Lord Jesus Christ send angels of comfort to the Rivers family during this difficult time and take comfort that some day they will see her again with a brand new healthy body. Brother Christopher, while I am sure that your kind wishes for Ms. Rivers’ family hold nothing but the best intentions, you might wish to rephrase them a bit, as the Rivers family is Jewish. Having been raised Jewish, I can tell you from experience that it is highly offensive (and just plain annoying) when a well-meaning Christian either assumes they are of the same faith or tries to push their faith on them. While I have no doubt that was not your intention here, I am sure you would not wish your kind words to be misinterpreted. When we send prayers someone’s way we pray to our own God and in our own belief system, not to whom the family or deceased worshipped. As being a minister in an interfaith church, this should be something to expect and appreciate. And it most deifinitley shouldnt be taken in offense when ministers here especially do not send condolences in your faith. What a beautiful tribute to our colleague, who is now in the afterlife making the angels (and the Divine) laugh. I can hear them now, cracking up. May her soul and all the souls of the faithfully departed, through the mercy of God, rest in peace! Years ago at Lake Tahoe, Joan gave me a bottle of Beefeaters Gin. She was a gracious lady. I will never forget her. Joan I know exactly what you’d say to all of us. “Remember Me With Smiles and Laughter, For That’s How I’ll Remember You. If You Can’t Do That, Then Don’t Remember Me At All!”. That’s exactly what Ms. Rivers would want for usto rremember her one if a kind comedic outlook on virtually every aspect of human life. What a gift we were all lucky enough to share for 50 years! Have a blast performing on God’s stage! Aloha & A Hui Ho Joan!! Joan had a rare wit and will not be forgotten. May she rest in peace. I’m so proud to be joined in some way to her path because she walked strong. How wonderful to learn that besides all of the great comedy She gave to the world and made us laugh that She also had a very caring side and helped fullfil the wishes of those that wanted to spend their lives together. Rest in Peace, Joan and keep them laughing in heaven. Joan you were an amazing woman. You brought love and laughter to many. 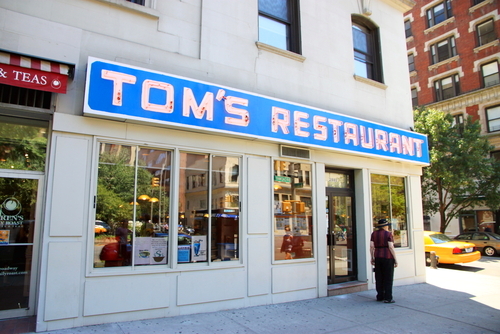 You will truly be missed. R.I.P. Joan. RIP, Joan. Keep them laughing in heaven. How could this foul mouthed entertainer be ordained as a Christian minister? Did she ever renounce her faith in Judaism? She always claimed to be Jewish. If she became ordained only to meet a legal requirement to marry homosexuals, then shame on ULC. We will pray for you. um, Al, we aren’t a Christian church, and we would never make a minister renounces her faith. Did you check into what this organization is about or make some assumptions? May Melissa, and all of Joan’s family & friends, find peace and comfort in the arms of our Heavenly Father. Bless you Joan for allowing us to share in your gift of laughter. Peace. Until we meet again. We will miss you and I pray we meet again. Thank you for all the laughter and wisdom. Now, make them laugh in heaven…this will be your greatest audience ever. Joan you will be remembered as a comic legend with a loving heart who made the world a better place. You are cherished and you will be missed. Joan Rivers was a woman before her time! I’m grateful to have lived during her time… Some party up in heaven and back in the arms of her beloved Edgar!!!!! Its wonderful to watch a person live in the spirit God blessed us with..Love, joy and soundness of mind..Thank you for sharing that with the world..May God Bless your family with peace, love and laughter. Reverand Joan you crossed boundaries and did it with love. You blessed us with your wit but also with your compassion. May the work you began on earth continue now that you are at peace. Melissa your angel will always be on your shoulder. God bless you too. Joan: Remembering the first time we met…1971 on Miami Beach. See you again later in the ethereal realm of spiritual bliss. I just think this a beautiful thing to remember her like this. We already miss you. You were such a giver Blessing and prayers to Melissia and the rest of your family. Met you once and have alway thought you were great! Joan Thank toy for your endless blessings yo live on in our hearts.peace be with you. Daring to just be herself was her most amazing accomplishment.She has always been inspirational and still 4ever will be.RIP galfriend. Wit and humor and have certainly lit alot of dark days. The Angels took another one home….. We love n miss them all. Love Laugh Life 4 ever. Joan, God bless you and keep you! are you serious? Christian..or otherwise, ULC is not a church. I am proud to be a member and am defiantly non-denominational, but have been baptist, christian science, LDS and catholic, and, and, and. good grief, sorry Joan,……… some times we get wrapped up in the “ID”, ego and specifics. We wish you happiness in what ever afterlife you have chosen and are thrilled to have have had you as a human being on this earth to pass to us some smiles and good endorphin physiological chemicals for our health and well being. All of us deal with life in many different ways. This was hers. We all work daily to become a better person for all humanity and for their betterment, even with all our faults, as others notice more of others, then their own. as humans. Caring: one step closer to humanity ! God and His Angels will never be the same with Joan there, as I’m sure she has them laughing so hard their wing feathers are fluttering and their halos are flickering. Joan was a wonderful, caring, loving person who be missed by many. God bless Joan Rivers! She was a “Comedians Comic”!